The Ke Kai Ola Education Intern supports marine science education programs offered by Ke Kai Ola, The Marine Mammal Center’s Hawaiian monk seal hospital located in Kona, Hawai’i. The internship will work remotely, but will require travel to Ke Kai Ola a minimum of two times, though increased travel will provide for additional experiences. It will also include supporting operations at locations island-wide and remote work opportunities. This role focuses on supporting the development and facilitation of education programs. Under the direction of the Center’s education team, interns will gain exposure to all aspects of Ke Kai Ola operations to gain valuable experience and inform their ability to translate Center operations into high quality education programs. A primary aspect of the internship will be to work with the School & Extended Learning Programs team to identify and execute a project of interest to the intern and should benefit Ke Kai Ola education programs and the community. The position is supported and supervised by the Coordinator of School and Extended Learning Programs (based in Sausalito, CA), with direct onsite support from Ke Kai Ola’s Marine Science Program Specialist. The intern role requires self-direction, initiative and passion. This role is part-time (15 hours per week) and is scheduled accordingly dependent upon your selected project work. Priority will be given to a recent graduate with a connection to the island, local community college students or a University of Hawai‘i at Hilo student who will use the internship as a project to fulfill the requirements of a Marine Option Program (MOP) project or for a Senior Internship Project, but all are invited to apply. Work with education staff to develop and execute a project of benefit to Ke Kai Ola education programs based on your skill set and passions. Support Nā Kōkua o ke Kai, the middle school marine science program curriculum including field trips and resource management. Assist in developing a variety of programs related to Ke Kai Ola and ocean conservation. Organize and assist with the set up and break down of education events. Navigate participant questions and help direct them during programs. Interpret and explain the care provided for monk seals at Ke Kai Ola including animal behaviors and animal care procedures. Stay abreast of The Marine Mammal Center and marine science news to be able to inform and enhance programs and inform the public. Adhere to The Center's personnel policies and procedures as defined in the employee handbook and as communicated by management. Attend trainings and check-ins when possible. Enthusiasm for engaging with marine science content for ages Pre-K to adult. Strong communication, inter-personal, and writing skills. Exceptional customer service capacity with a variety of audiences. Self-directed and ability to take initiative and see projects through to completion with minimal supervision. Attention to integrate new technologies into programs. Skill and confidence with using Microsoft Office suite of programs. 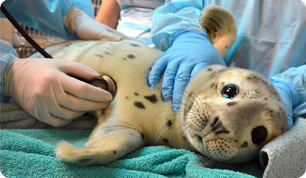 Ability to communicate well and work as part of a multidisciplinary team to advance the mission of The Marine Mammal Center. Ability to drive to support activities around Hawai’i Island. Two or more years of undergraduate college work required in education, marine science, conservation biology or a related discipline. Background and/or experience in leading/teaching school groups. Background and/or experience in environmental education and natural sciences. Ability to engage and communicate with audiences of all ages and provide exceptional customer service to a variety of audiences. Must have access to transportation. Must submit to and pass background check. Must obtain TB test and any other medical examinations or vaccinations as required by state or federal regulations. Ability to stand/walk up to 6 hours without a break and lift and/or move up to 40 pounds. Ability to multi-task efficiently and prioritize deliverables regularly. Proficient in Microsoft Office Suite (Word, Excel, PowerPoint, etc.). Attention to detail and quick to learn. "Can-do” attitude and willing to take on new projects as needed. Internships will commence the week of August 27 and contribute 10-15 hours a week (165 hours total) through the end of the semester with the possibility for an extension or additional opportunities through January 2019. Interested and qualified applicants are encouraged to apply by following the link below. Applications will be accepted until August 19, or until the position is filled.